"I'm very pleased with the crew and their work! " I'm very pleased with the crew and their work! "I am VERY impressed with the crew - Jose, Steve, and Ernesto. They were so hardworking and thoughtful. Amazing! I am beyond happy..."
I am VERY impressed with the crew - Jose, Steve, and Ernesto. They were so hardworking and thoughtful. Amazing! I am beyond happy with the work. Thanks to the guys for all their hard work and even letting the dogs out! They rock! Richard K. in Redwood Falls, MN had a cracked and bowing foundation and water seeping into his basement. 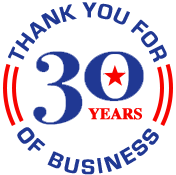 He started to do some research online and was happy to learn that American Waterworks has been the leading waterproofing and foundation repair contractor in the region for 30 years! We sent one of our Design Specialist, Eric Hazelton, to meet with Richard, evaluate the situation, and propose a unique solution that fit his needs. Richard approved of the plan and moved forward with the project. Our Foreman, Jose Castillo, and his production crew were able to permanently stabilize the damaged walls by installing 6 Geo-Lock Wall Anchors along the foundation, which immediately halted the deterioration and began to straighten the walls. Next, the crew installed a full perimeter WaterGuard drainage system and our recommended TripleSafe sump pump. These products work together to ensure Richard’s basement is solid and dry! Richard was pleased with the process and glad he made the investment to protect his home. Do you have cracks in your foundation? Click here to learn more and to receive a FREE estimate!